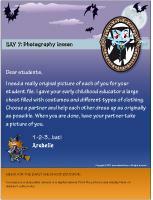 (Open thematic poster-Halloween-Sorcerer school) Print, laminate, and decorate the walls of your daycare with all kinds of posters. 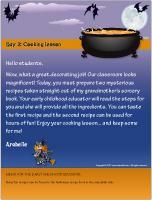 The educatall team has prepared a series of special activities for the weeks leading up to Halloween. 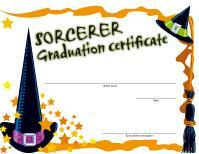 The children in your group are invited to attend sorcerer school and become real sorcerers. Arabelle, the school's principal, will guide them in their lessons which can be presented over a period of 10 days. 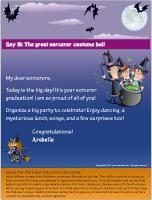 At the end, you can organize a sorcerer graduation ceremony (Open Arabelle the sorcerer) Print the puppet and use it to present the letters to your group. Print the letters and prepare a scenario for your group. 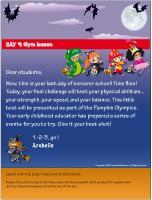 Create a special Halloween mailbox and deposit a new letter inside each day. Let children open the letter and read it to them. Together, work on the suggested challenge or enjoy the activity proposed by Arabelle. Hang a clothesline within the daycare and use it to display pictures of each completed activity. 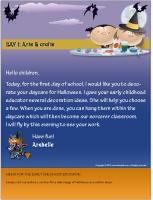 Today, for the first day of school, I would like you to decorate your daycare for Halloween. I gave your early childhood educator several decoration ideas. She will help you choose a few. When you are done, you can hang them within the daycare which will then become our sorcerer classroom. I will fly by this evening to see your work. 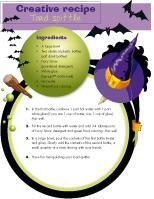 Simply visit our archives section for a wide range of Halloween decoration ideas. Wow, what a great decorating job! Our classroom looks magnificent! Today, you must prepare two mysterious recipes taken straight out of my grandmother's sorcery book. Your early childhood educator will read the steps for you and she will provide all the ingredients. You can taste the first recipe and the second recipe can be used for hours of fun! Enjoy your cooking lesson... and keep some for me! Other fun recipes can be found in the Halloween recipe book in the educatall club. In the first bottle, combine 1 part hot water with 1 part white glue (if you use 1 cup of water, use 1 cup of glue). Mix well. Fill the second bottle with water and add 3-4 tablespoons of Ivory Snow detergent and green food coloring. Mix well. In a large bowl, pour the contents of the first bottle (water and glue). Slowly add the contents of the second bottle, a small quantity at a time, stirring with your hands. You are extremely talented! Until now, you have completed each challenge I have presented. We have rarely seen such a successful group at the sorcerer school. Today, we are going to evaluate your artistic talents. You will each be given a canvas to paint on. Using paint and paintbrushes, I want you to paint my portrait... to reproduce my beauty. Your early childhood educator will display your masterpieces on the walls of the classroom so I can admire them. You can purchase canvases at the Dollar store or simply use white pieces of cardboard. Did you know that the sorcerer school has its own choir? A choir is a group of people who meet a few times a week to sing different types of songs together. Your early childhood educator will give you your song books. Use the books to practice your songs at school and at home. Practice as often as you wish, even when you are playing outside with your friends. 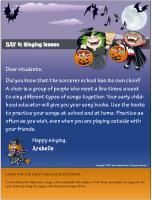 You will find a few Halloween songs in the educatall club archives. Print them and create a song book for each child by joining the pages with black and orange ribbon. How are my sorcerer trainees this morning? Today, I must measure your abilities through several tests. Some of these tests are easy, others are more difficult, but I promise, they are all fun! You must visit each booth and try all the games. Don't worry if you don't successfully complete each test, I only want you to have fun! You will find several games in the educatall club archives. Pick the ones you like most and print the necessary material or set up booths just like a fair using the following suggestions. 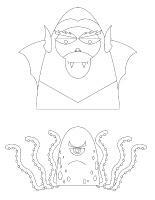 (Open models-Monsters) Print several models and have children color them. Next, cut them out and glue then on empty soda bottles. Arrange the bottles in a triangle. Let children try to knock the bottles down using a pumpkin. Children will love this game and they will want to start over again and again! Purchase five pumpkin-shaped buckets and line them up next to each other. Draw a line on the floor and give children bean bags wrapped with Halloween wrapping paper. The object of the game is to toss the bean bags in the buckets. You can attribute a certain number of points to each bucket if you wish and keep score. Variation: Instead of using bean bags, you may decorate dog bones and use them to play a game of skeleton toss. 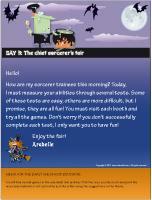 (Open game-pumpkin) Print, laminate, and display the pumpkin on a wall. Much like pin the tail on the donkey, children must try to place the pumpkin's nose as close to the correct spot as possible while blindfolded. (Open twister-Halloween) Print and glue the larger images on the floor using adhesive paper on a 4 ft² area. The leader of the game picks one Halloween card and one body part card and gives the group instructions like in the traditional Twister game, "Place one foot on the cat, one hand on the ghost, etc." 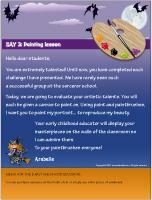 Variation for younger children: Use the illustrations to decorate the daycare or for a recognition game. For example, ask children to identify the witch. You may stick the illustrations on the floor... younger children will admire them. Simply use an orange garbage bag (for leaves) or one with a Halloween design on it. Fill it with leaves and hang it in a tree in the backyard. Let children hit the "piñata" until it bursts open. Children work in teams of two or three players. One child in each team is the mummy. When you give the signal, team members must wrap the mummy with toilet paper to the sound of music. When the song ends, the team which wrapped its mummy the best wins. Fill a large container with cooked macaroni and add a few drops of dishwashing liquid. Hide 10-12 plastic spiders in the container. Children take turns trying to find the spiders as quickly as possible. Provide non-toxic makeup and mirrors. Let children paint their own faces. Blow up several orange balloons so that you have enough for the duration of the fair. Tie a piece of ribbon to each balloon so that children can tie them around their ankle. Two at a time, children must try to pop the other child's balloon while remaining in a designated area. 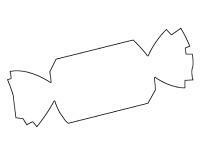 On a large piece of white cardboard or on the floor, draw an oversized tic-tac-toe grid. 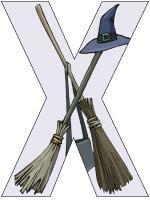 (Open game-Halloween-tic-tac-toe) The witch brooms will represent the "X's" while the pumpkins will represent "O's". Children take turns depositing a symbol on the grid. The first child to deposit three matching symbols in a row wins. Today, I invite you to explore pumpkins and squash. 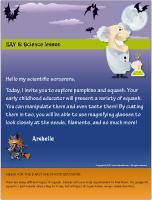 Your early childhood educator will present a variety of squash. You can manipulate them and even taste them! By cutting them in two, you will be able to use magnifying glasses to look closely at the seeds, filaments, and so much more! There are many different types of squash. Simply visit your local supermarket to find them. The spaghetti squash is particularly interesting to study, but all types of squash have unique characteristics. I need a really original picture of each of you for your student file. I gave your early childhood educator a large chest filled with costumes and different types of clothing. Choose a partner and help each other dress up as originally as possible. When you are done, have your partner take a picture of you. You may use a disposable camera or a digital camera. Print the pictures and display them on children's cubby holes. Your sorcerer course is almost complete. I am very proud of everything you have accomplished so far. Today, with your early childhood educator's help, you will create a short play involving well-known Halloween characters (black cat, pumpkin, witch, bat, monster, etc.) 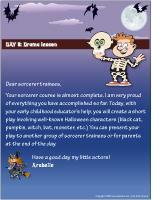 You can present your play to another group of sorcerer trainees or for parents at the end of the day. Have a good day my little actors! Wow, this is your last day of sorcerer school! Time flies! Today, your final challenge will test your physical abilities... your strength, your speed, and your balance. This little test will be presented as part of the Pumpkin Olympics. Your early childhood educator has prepared a series of events for you to try. Prepare the following events and visit the educatall club's archives for medals which can be printed and handed out at the end of the day. Divide your group into two teams. Determine a start and finish line and deposit a cone on the finish line. When you give the signal, the first child from each team must pick the pumpkin up, walk to the finish line, go around the cone, and walk back to the start line to hand the pumpkin to the next player. The first team to complete the event wins. Note: Be sure to have different sizes of pumpkins on hand. Divide your group into two teams. Deposit two baskets on a line and draw another line on the floor to determine where children must stand. When you give the signal, the first child throws three miniature pumpkins, attempting to toss them in the baskets. Continue until each child has had a turn. Note: You may also use orange balls instead of pumpkins. Fill two buckets with water and deposit them on a start line. Deposit two empty buckets at the other end of the daycare. Using plastic pumpkin pails (used to collect candy), children must transport water to fill their team's bucket at the opposite end of the daycare. Note: You may use powdered orange juice to make the water orange. Each child must have a partner. One child lies on his stomach, resting on his arms. His partner raises his feet. Deposit a tiny pumpkin on the back of the children representing the "wagons". Each team must try to move towards the predetermined finish line without dropping their pumpkin. (Open Halloween shapes) Trace, cut out, and glue Halloween shapes on the floor. Children must hop on the shapes to cross the daycare. Invite children to sit in a circle. Give one child a miniature pumpkin. They must pass the pumpkin around the circle without using their hands. Show them how they can use their neck to pass the pumpkin to the child sitting next to them. If a child drops the pumpkin, he must sit in the centre of the circle. Continue until there is only one player left. Play music and encourage children to dance throughout the daycare. You are a sorcerer. When you touch a child with your magic wand, he/she becomes a statue. When you touch a child again, he/she can resume dancing. Today is the big day! It's your sorcerer graduation! I am so proud of all of you! Organize a big party to celebrate! Enjoy dancing, a mysterious lunch, songs, and a few surprises too! Invite children to wear their Halloween costumes throughout the day. They will be so proud to show you their costume! Decorate your daycare to represent a haunted house. Close all curtains and use as little light as possible to create a special atmosphere. For lunch, simply use strange names for the foods you will be serving (toad tongues, mice feet, etc.) Add green food coloring to children's milk, just for fun!